For many more reasons than I care to get into in this post, our family believes in the Easter Bunny. We also believe in Santa and the Tooth Fairy. We believe in little leprechauns too… at least Patrick does. Michael doesn’t believe in leprechauns and Elise is scared of them so for two very different reasons we told two very different kids that there is no such things as leprechauns. For now, though, we all believe in the magic of the Easter Bunny. 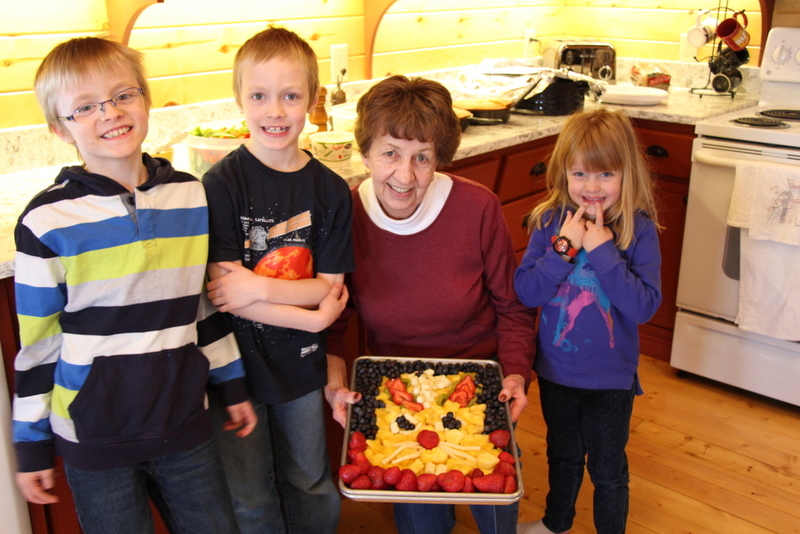 My Grandma, the kids’ Great Grandma, knows this and for Easter she made this wonderful tray of fruit shaped like the Easter Bunny. This is the first Easter that we have travelled to see my family since we moved to MN 7 years ago. It is a long drive to see them and because Tim doesn’t get any work days off for the Easter holiday, it means taking vacation time. In the past we have opted to save that vacation time for longer Christmas breaks or a bigger chunk of time in the summer but after a long winter we needed a break. The cabin, with my parents and a visit from my Grandma, Grandpa and Sherlene at Easter, was that break. We are Christians. The kids know why we really celebrate Easter just like they know the true meaning of Christmas. But that doesn’t mean we can’t enjoy a little extra sprinkle of magic on top of a Holiday that already has us gathering as family. In the end it boils down to this, life is short. The kids are growing up way too fast. The window of believing in that magic is so slim. Any time we can be together as a family and add a little magic to the fun, we will do it. Life is too short not to believe. The kids and I have been gone for two whole weeks. Before I allow myself to dump photos I need to tackle our jungle of a lawn, a mountain of laundry and unpack. It is great to be home but I did not miss all the responsibility that comes with being a home owner. It is always more fun to do dishes at family member’s home while chatting and catching up with loved ones than it is to tackle the dishes at home while listing all your other to-dos in your head while you scrub eggs off a frying pan. My motivation is clear, I am getting chores done so I can play with my camera and editing software. Ready. Set. Check email. Check Facebook. Check Instagram. Check Twitter. Check email again to see if any new important emails appeared like free lawn mowing service for tired moms. No free lawn services so… Go! On Saturday we went to the Zoo. It was a long day and it wore the kids out. On Sunday the kids were up bright and early like they are everyday but they were definitely dragging. The boys were not happy about it but they still helped out and did their chores. Elise didn’t help out. She was the opposite of help and seemed to time the start of her mess making with the completion of a clean room. Nothing is more frustrating than to clean a room and have it messy again in two minutes. A tired Elise is a cranky Elise. A cranky Elise is a whiny Elise. A whiny Elise is an Elise who grates on Tim and my nerves. 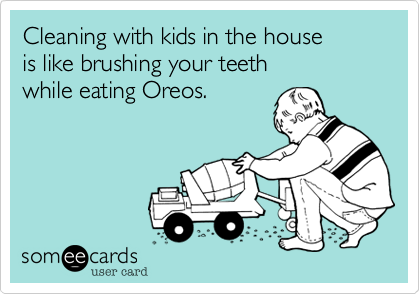 She refused to clean up after herself and flat our lied and blamed her mess on her brothers so she was sent to her room because Tim was vacuuming the time out spot at the bottom of the stairs. She screamed and cried and I am sure the neighbors were thinking we had rethought our stance on corporal punishment. In our house time out time doesn’t start until the kid is quiet. Elise screamed for 20 minutes. 5 minutes after she had stopped screaming I went up to talk to her about why she was in time out and to tell her that lying is bad. This is what I found and I quickly tip toed back downstairs to get my camera and hurried back up to snap a few photos. She slept through me taking a dozen photos and stayed sleeping until the boys were sent upstairs to put away their laundry. She woke up and was even crankier than before but she cleaned up her messes so Tim and I count it as a win. 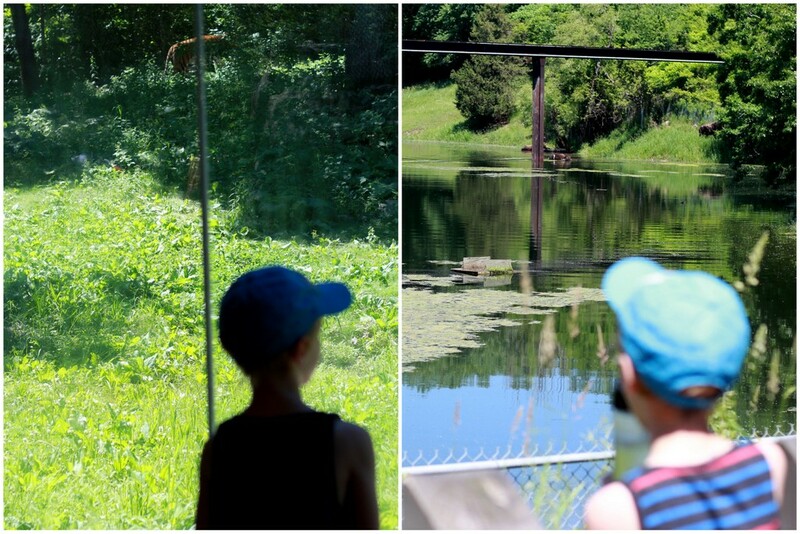 This weekend we went to the MN Zoo and spent most of our time at their Big Bugs exhibit. It was a hot day and to be honest, the heat and the crowds tested Tim and my marriage a bit. Just like Target runs, going to the zoo mid-week is always better than on weekends. We braved the crowds and the heat so the kids could experience the zoo with their Dad. This is kid far to cool to be Tim and my kid. Look at him posing like a child model. It was a fun day filled with giant animatronic bugs, layers of sun screen and Tim and I shooting glares at each other while we each counted 1 kid, 2 kid, 3 kid over and over, both thinking the other wasn’t paying enough attention. We picked up Beth on the way to the zoo. Have I mentioned how much I love living so close to family again? The only people who love it more than me is the kids. Michael thinks he is a zoo tour guide because he went on a school field trip to the zoo and because of our few trips to the zoo this spring. He was happy to be in charge of the map and lead the way. The best thing about having a zoo membership is that there isn’t pressure to get all the bang for your buck like when you buy a day pass. Because of this we cruised by most of the animals and headed right to the big bugs. Michael has done some light reading on bugs and was able to tell us a lot about the different classifications and why some bugs looked like spiders but were not spiders. I think it is great that he is interested and learning, but I draw the line at bug collecting. This bug (I was too busy taking photos to learn the scientific names) was animatronic and the kids were able to manipulate the controls. And here is my favorite photo of the day. I told Patrick to make a face like there was a real giant grasshopper behind you. I think Elise’s favorite part of the day was the cooling mist faucets.